1. I am not exactly a morning person, so the fact that it is 7:55 a.m. (actually, 7:49…that clock is about 6 minutes fast) and I was almost to the office is amazing. And in case my recently learner-permitted daughter is reading this (doubtful, but whatevs), no, Meghan, I did not take the photo while driving. 2. I was 22 miles from an empty tank. Look at the temperature. Who wants to stand outside in THAT and pump gas?? Yes, I had been putting off stopping for gas for a few days. I was actually at the gas station to fill up when I took the picture. 3. The temperature. FIVE degrees, and that ain’t Celsius, dear international friends. 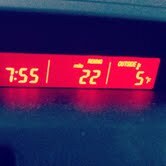 That is FIVE degrees, and the windchill this morning was well below zero. Cold. Miserably cold. Wish-you-were-back-in-your-warm-snuggly-bed-avoiding-the-day cold. I know my Canadian friends are probably just shaking their heads and laughing smugly at me, but that’s really. stinking. cold. And, yes, I’ve lived in Indiana my entire life, and this is not unusual…but that doesn’t mean I have to LIKE it. And this morning, as I stood there in the blustery January cold, pumping my gas and thinking about my pending workday, I thought of the importance of good planning, communication, and looking out for your learners. Today, at the day job, we kicked off a three-day training event for some folks who are based in the field, rather than at our corporate headquarters. I hadn’t been the point of contact for the participants, so I was looking forward to meeting everyone. But then, I thought (and got a little worried…must be the Mom in me)….where were these folks coming from? Had anyone given them a heads-up about our ridiculously cold weather? If I were from, say, Miami, I would definitely be appreciative if someone had called or sent a quick email to let me know that the weather would be much, much colder than I was accustomed to and to make sure I packed accordingly. Fortunately, someone did let them know about the weather. And we do have 2 Floridians and an Arizonan with us this week, so if they weren’t sure before this week why people move to places like Florida and Arizona when they retire, you can bet your parka that they get it now. 1. Check for dietary restrictions when planning meals and snacks. Gluten-free, dairy-free, nut-free, vegan (etc)…allergies and food sensitivities run rampant these days. And we should always be aware of possible cultural diet restrictions. Survey your participants ahead of time when planning meals, and accommodate any special needs. 2. Organize your agenda to include frequent, short breaks. Gives you, the facilitator, a moment to catch your breath and regroup! This can be achieved in the development stage by conducting a thorough Training Needs Analysis. This can be achieved by reaching out to participants ahead of time. This can be achieved by getting to know your participants throughout the training. Do your homework, friends. How do you get to know your learners before, during and after a training event? I have had the privilege of facilitating thousands of training sessions throughout my career, covering everything from very basic skills to very complex systems and processes. One thing that rings true, regardless of the topic, is that your participants have needs. Sure, they “need” to learn the material you are sharing with them, but they also come with their own basic needs and expectations. It’s our job to identify their needs, and exceed their expectations. Even when it’s 5 degrees outside, and you’d rather be in your warm, snuggly bed.